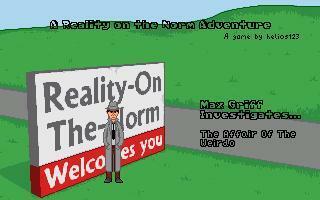 When the Town Weirdo comes to Max Griff's office claiming he's being spied on, Max doesn't take him seriously. However, when the Weirdo is attacked, Max takes the case to discover the identity of the attacker and their motive. i was enjoying this game up to the point were i couldn't exit from the museum . Certain points in it go against RoN's backstory like the multiple bullets when Reality only has one bullet (mentioned earlier in the series I think it was in the game about the chicken getting vengeance on the barons brother) and Max isn't a detective he's a P.I, Detectives work for the police. A lovely entry in the Reality on the Norm-series, that takes a good deal of characters and plot developments from earlier RON-games (making excellent use of them) while creating a whole new story, setting up a set of interesting new plot points. RON-fans certainly shouldn't miss out on this, and people new to RON might get a good impression from this game of the fun and depth that the series has to offer.